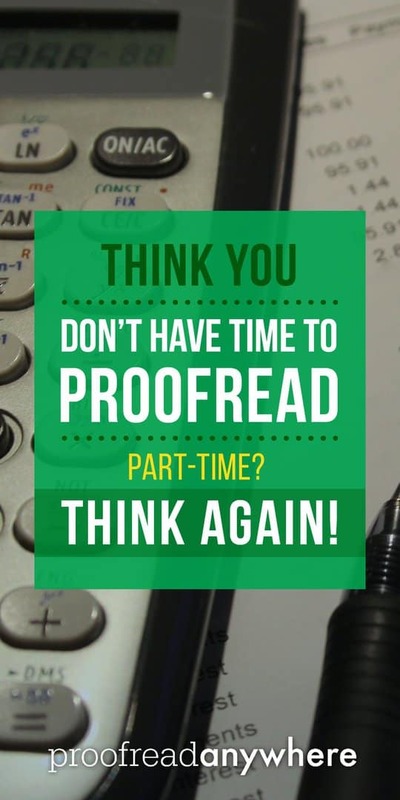 Part-time proofreading is a great side gig to your full-time job -- even if you're a numbers person! Time. There’s just never enough of it, right? Our days are packed with work, family, social obligations, and a million other things to do. You might think there’s absolutely no room to add anything else to your already-packed schedule — especially if you’re already working a full-time job. How in the world could you add a part-time transcript proofreading gig on top of that?! Well, guess what? You CAN! And we have proof that you can successfully rock at both. Check out this interview with our very own PA grad, Maria. She is a total numbers person by day (as a full-time accountant) and a part-time proofreader by evenings and weekends. Hi, Maria! Can you start off by telling us a little bit about your background? I’ve always loved to read since I was very young. I was that student who was always in the school/city library, the bookmobile, and always got a free pizza for BOOK IT!. For study hall, I signed up to work in the school library instead, and I’d get in trouble sometimes for reading during classes. As I grew up, I’d notice spelling and grammar errors in the books I’d read and other everyday places. As much as I love to read, I’m also good at numbers, and that’s what I ended up doing as a full-time career. But I’d always thought it would be great to get paid to read and find errors. It seemed like most of those types of jobs require some sort of degree, though. That is, until I found Proofread Anywhere two years ago. You were an Eagle Eye at a young age — love it! So when did you start proofreading transcripts, and what made you decide to learn how to proofread transcripts? I found out about the Proofread Anywhere course in early March of 2015. After corresponding with Caitlin, I signed up for the free 7-day intro course. Once I went through that, I realized that even though I had a knack for finding errors, I needed more training when it came to proofreading for court reporters, so I signed up for the course right after that and finished at the end of May of 2015. The fact that I didn’t need a degree to do this was a major factor in my decision to learn how to proofread transcripts. I had also been trying to find a way to make some extra income on the side since I do still have a day job. This seemed quite convenient because it wouldn’t require me to go to another physical job location to work. Plus, it would be something I’d enjoy doing and wouldn’t really seem like work. I also hope to eventually leave my day job and make proofreading one of my few freelancing jobs instead. Side hustles are definitely more common these days. What was the most challenging part for you in getting started? The most challenging part was finding the time to take the course with everything else I have going on. But because of the portability this job offers, I was able to find time to take the course at my own pace, and it was easier than I thought it would be. What was the most valuable thing you learned during the course? I would say learning how to market myself was most valuable to me. I have never been good at sales in general. In the past, I’d signed up for a few direct sales companies, but I never really made any money because I’m just not good at sales. But the course teaches you how to market yourself and in more than one way — and it worked! I no longer fear putting myself out there and reaching out to potential clients. Way to conquer your fear! How long did it take you to find your first client, and how many clients do you have now? 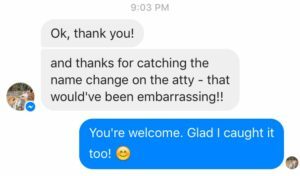 Well, I have a court reporter friend, and she started sending me work once I finished the course. But on my own, I was able to find my second client within a few days of finishing the course. Right now, I have six clients. Three of them send me work on a regular basis, and the other three send me work on a more spread-out basis. I never thought I’d be able to take on several clients while still having a day job, but it’s worked out well so far. The nice thing is that I can always take on more clients as the need arises and my circumstances change. What advice would you give anyone thinking about enrolling in the course? Is it really worth the money? I would say that it’s worth every penny. If you like to read a lot and you have a knack for catching errors, then this might be a good fit for you. You might find, at first, that you thought you knew how to proofread but really don’t. That’s where the course comes in. The free 7-day intro course made me realize that I didn’t really know as much as I thought I did about proofreading in general. But that didn’t stop me. It actually made me want to learn more about specifically proofreading for court reporters. Any parting words for our fellow proofreaders? If you’re really serious about proofreading, you can make it work. It will take time to go through the course, but you’ll have all the information you need to make this a part-time or full-time career. For me, finding Proofread Anywhere has also opened the door to other opportunities I wouldn’t have considered before. 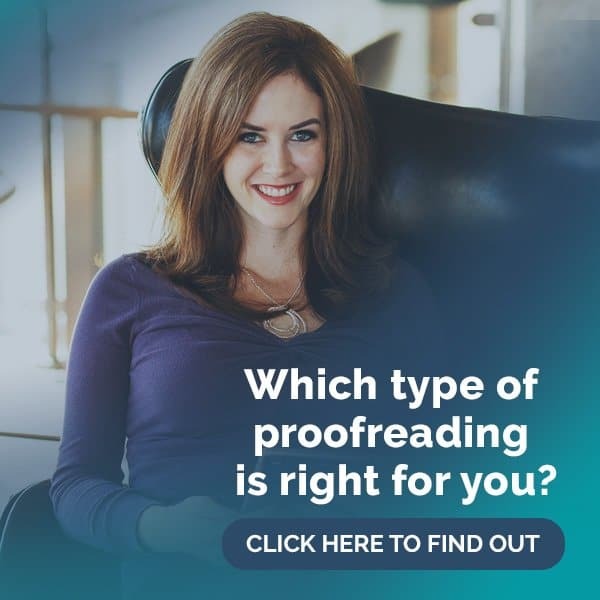 In the almost two years I’ve been part-time proofreading, I’ve branched out into proofreading for businesses, academic proofreading, and copyediting, and I continue to look into other avenues of proofreading as well. All of this has also led me to further branch out into being a virtual assistant, not only as part of the Proofread Anywhere team but also assisting a few court reporters as well. Really, the sky’s the limit. 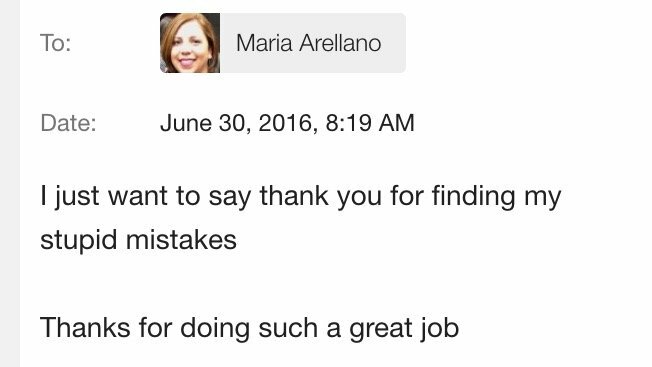 We love that Maria is running a successful proofreading side gig while maintaining her full-time accounting job. You CAN find time to hustle and work on the things you love while still working a 9-to-5! We know Maria is going to continue to rock and eventually turn her part-time proofreading business into a full-time job, and we’ll be there to celebrate with her when it happens! Do you have questions or comments for Maria? Leave her a comment below! This looks to be right up my alley. I was looking as starting this as a part-time gig in addition to my full-time job as well. Glad I am not the only one. It would be nice to have it grow into a full-time job, but I am going to take it slow. You’re welcome! For me, it’s still a part-time gig because I still do need my day job. But I know one day I’ll be able to leave my day job and I’ll already be established in my freelance side gigs. Taking it slow is smart too. You don’t want to rush through the course just to start proofreading right away. Court reporters will know if you’re not skilled, so it’s best to take it slow and take the course material in until you understand it well. Maria, I am curious how you handle marketing through LinkedIn (assuming you do) or other channels since you do have that day job. Do you have both listed on LinkedIn, just your day job, neither? I am curious how to go about doing that, since I don’t really use LinkedIn much in my field, but do have a page, connections, etc. I am not trying to keep a side hustle a secret really, but wouldn’t want colleagues from my day job to ever wonder if my side job was impacting my work. Not sure if this is a real concern or one I have created in my head though! Even though I am on LinkedIn and do list both of my side gigs on there as well as my current day job, I’ve never gotten a client through there nor do I use it for that reason. I had a LinkedIn page way before I got into proofreading. I do know that several of my colleagues have looked at my profile but it’s never come up because it doesn’t impact my work at all. Whether you decide to use LinkedIn or another source for marketing is totally up to you, though. You know better how your current colleagues will see it and if it’s something you want to put out there or not. But the course teaches so many other ways to go about marketing so you don’t have to limit yourself to just LInkedIn or Facebook or other social media platforms. You won’t know until you try, so I suggest signing up for the free 7-day intro course. Maria’s my proofer and she’s the best! This is such a timely piece. I needed to read this. Maria’s road to proofreading mirrors my own. So does her work situation. Her story is just the kick I need to finish the course. Congrats, Maria. I wish you continued success. Thank you, Tira! I hope it works out for you too. Keep us updated in the PA Facebook group. I will definitely update everyone in the FB GRIUP. I just wanted to comment and say that Maria has been nothing shy of great! 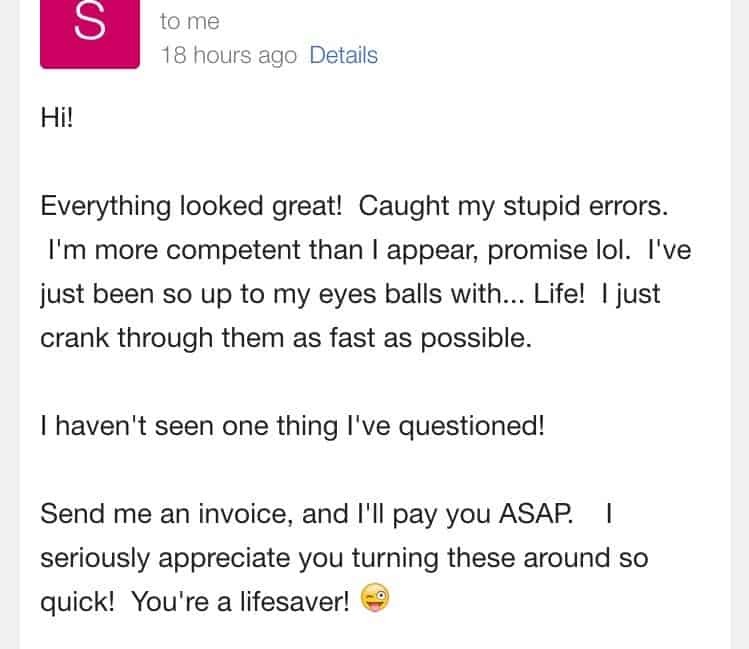 You can tell her heart goes into every job she proofs, and she never fails to catch my mistakes. She’s saved me on numerous jobs — actually, probably every job — from looking like an amateur. I absolutely love working with Maria, and I would never hesitate to recommend her! Maria has been my proofer for well over a year, and I feel SO lucky to have found her. She is amazing at what she does. She can take a jumbled paragraph of nonsense that I’m stuck on and turn it into something smooth and flowing. With her proofing my transcripts, I am 100 percent confident that my final drafts are clean and readable. I don’t know what I would do without her! However, my dream job would be to proofread for authors and freelance writers. Does the PA course cover this area also? I want to learn everything I can, but it’s a big load of money for a mom of four! I’m just checking that it would help me in all areas, even if court transcripts aren’t for me. I’ve had the free 7-day emails already sent to me, so I know it is definitely good information! I’m just checking with you because it seems you’re doing exactly what I’m wanting to do by keeping my day job (I ❤️ it), doing the Mom job (I ❤️ it more! ), and adding the part time portion as well. When is the general proofreading course going to be released? Thanks! The new course will be released on April 25th. 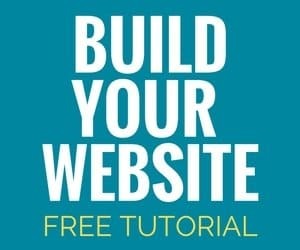 Keep an eye on the http://www.proofreadanywhere.com website for a new look and more info on the course. Thank you for such a quick reply. I hope to be at your level one day! I am a retired Calif/Arizona/Federal court reporter and would love to do proofreading part time. I hired a proofreader for most of the 32 years I reported, and now it seems like the perfect job! What a long career you’ve had. Your experience definitely makes proofreading a good fit for you. We’ve actually had some former reporters and even scopists take the course too. I’m sure your many connections will come in handy if you decide to pursue proofing part time. I have a feeling it’ll work out for you. I’ve been on this list a while and still don’t understand if this is a pay service that “finds” one proofreading jobs online or what. Or, how much does the course (?) 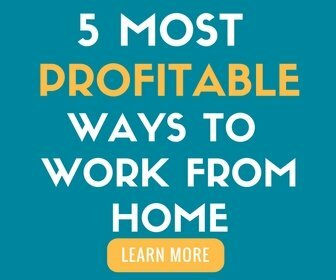 to learn to proofread cost? What if you don’t need a course? Are you paying for leads? Is it like rev.com? That was not for me. Thanks. Your love for reading is definitely a plus when it comes to proofreading, and you don’t need a degree either, but it’s a major plus to have a good command of the English language and not have it be your second language. Even then, it’s not impossible. I suggest you sign up for the free 7-day intro course to get a feel for what’s involved in proofreading as a form of work. I know it helped me decide to take the course. You have nothing to lose since it’s free. Do you think someone with a nurses schedule could do this? We usually only work 3-4 days a week, but they are 12 hour shifts. I’m worried about turn around time, but would love to try this. How many hours per week do you spend proofreading? I’m interested in knowing how you fit the work in, too, Is it before work in the morning or after in the evening? What about weekends? Great question! Our graduates fit in proofreading during all hours of the day, all the days of the week; some proof alongside full-time jobs in the mornings and evenings. Flexibility in setting your own schedule is the best part of proofreading!